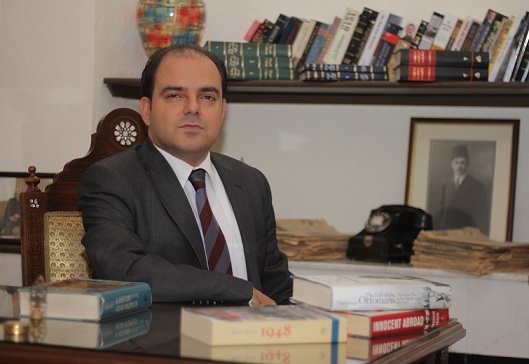 Historian and political analyst Sami Moubayed discusses his efforts to preserve the Syrian capital’s archives and cultural history and the war’s impact on the country’s many ancient sites and artifacts. Long before Damascus became Syria’s capital, the city was conquered by Alexander the Great, redesigned by ancient Roman architects and established as the capital of the Umayyad caliphate. Each civilization left its mark on the city, giving it an unparalleled cultural, political, social, economic and architectural history that has survived since the third millennium B.C. However, after six years of war in Syria, many of the city’s ancient palaces, historical homes, museums, artifacts and government documents have fallen into disrepair, been destroyed, stolen or even abandoned as people flee the conflict. 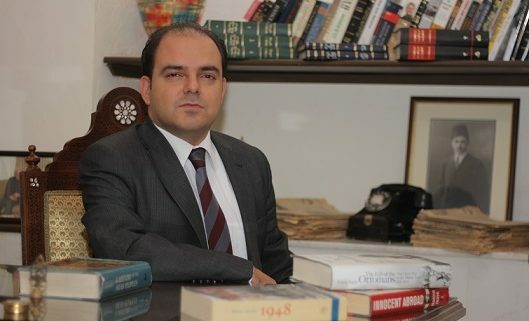 Today, a “high priority” for historians is saving city’s archives from the 19th and 20th centuries, which are “on the verge of extinction,” according to Sami Moubayed, founder of The Damascus History Foundation, a volunteer-based organization dedicated to finding and preserving the capital’s archives – from old scrolls, judicial records, government correspondence and land registry documents to books, newspapers, movie reels and music archives. However, according to Moubayed, also a historian and political analyst, “Damascus has suffered the least destruction when compared with other ancient cities like Aleppo, al-Raqqa, Deir Ezzor and Palmyra.” All six of Syria’s UNESCO world heritage sites have been damaged or destroyed since 2011, according to the U.N. agency. Among them is Palmyra’s 2,000-year-old Arch of Triumph, “a tourist attraction and source of pride” for the Syrian people that ISIS destroyed last October, he added. Syria Deeply spoke with Moubayed about the scale of destruction at Syria’s ancient sites and his efforts to find and preserve Damascus’ archives while building a community around the city’s rich history. Syria Deeply: Palmyra survived two ISIS occupations, the latest one ending following a pro-government offensive earlier this month. Is there any way to measure or quantify the destruction at Palmyra? Sami Moubayed: There is no final figure on the cost or time it would take to rebuild Palmyra; estimates range between three to 10 years. Five major sites have been destroyed during ISIS’s first 10-month rule: the temples of Bel and Baalshamin, the Arch of Triumph, the Valley of Tombs and the Palmyra Museum. During the second brief siege, from December 2016 to this March, ISIS destroyed parts of Palmyra’s famous amphitheater, which the militants used to film the execution of 280 civilians in May 2015. The two temples are not beyond repair, but the same cannot be said of the city’s museum that was destroyed by mortars, smashed and looted. It currently stands beneath a pile of garbage and debris and more than 200 artifacts have been completely destroyed with hard tools and sledgehammers. Many of the statues were decapitated and their hands were chopped off. Major damage – the collapse of the staircase to the main entrance and the eastern tower – was also found at the Fakhr al-Din al-Maani Castle, a Mamluk-era fortress overlooking the city that ISIS used in battles because of its high walls. Two Polish experts from the University of Warsaw are working on reconstruction of the Lion of Lat, a 15-ton statue at the entrance of the Palmyra Museum that ISIS destroyed in June 2015. The tiny fragments and large stone slabs are collected from all over the city, inventoried, boxed and shipped to Damascus for restoration. Much of the statue’s previous shape is restorable, but heavy work will be required around its nostrils. Syria Deeply: How does this compare to the destruction in other areas of Syria? Moubayed: Despite the horror of what happened in Palmyra, only 20 percent of the city’s archaeological treasures have been destroyed, according to the Syrian Directorate of Antiquities. The situation is far worse in Aleppo, where the old markets have been torched, the divine eighth-century Grand Umayyad Mosque completely destroyed, as was an ancient Maronite church, located 25 miles (40km) north of the city. In Deir Ezzor, the bridge crossing the Euphrates has collapsed. It was built by the French in 1927 and destroyed by the fighting in 2014. In September 2014, ISIS shattered the Armenian Genocide Memorial Church in Deir Ezzor. The marvelous Khaled Ibn Al-Walid Mosque of Homs in central Syria has also been ravaged. The list is long and goes on and on. Syria Deeply: Can you describe the process of documentation and preservation in Damascus today? Moubayed: Even before this war started, the process of documentation was horrible in Damascus. For example, the bulk of Syrian television’s black-and-white classics dating between 1960 and 1978, were left in a storehouse in Ghouta, in very poor conditions, exposed to dampness, rain and heat. What survived the negligence was destroyed in battles in Ghouta ongoing since 2012 – 15 black-and-white works survive until present. The same applies to the archives of the Syrian Parliament, which were bundled into boxes and shipped to Ghouta shortly before the conflict started. They have been lost along with the audio recordings of all sessions from 1947-1967. So have the splendid rugs and ancient chandeliers of the Grand Umayyad Mosque of Damascus. Some were stolen by the Ottoman Turks when they left the city in 1918, others by consecutive governments ever since. The archives of Damascus are divided chaotically between the National Museum, the Assad Library, the al-Zahiriya Library, the Arab Language Assembly, the Museum of Historical Documents, Damascus University, Damascus Radio and Syrian Television. The al-Zahiriya Library is extremely well-preserved and so are Damascus Radio and the Assad Library. The Damascus Museum of Historical Documents is in bad shape, with ancient manuscripts either stolen or damaged by negligence of mediocre employees. Government agencies vary with regard to their archives. I have been through those of Syrian Parliament, the Ministry of Culture and the Ministry of Foreign Affairs. Close to nothing survives until present at all three. There is a wealth of documents at private homes, tucked in attics and basements. Many of those homes are now abandoned because of the ongoing violence, or have been looted if they are located in war-torn territories. Syria Deeply: Can you walk us through the process of locating and preserving an archive? Moubayed: Our job is to find and preserve what is left. This is done through field work, personal visits to these sites and agreements to digitize and scan what we come across. We will then be creating an online museum for all that we find, and hopefully transform it into a real-life museum once the guns go silent in Syria. We also hope to train a new generation of Damascus historians in critical thinking and analysis, rather than an ideological old-school Baathist approach to their contemporary past. We hope to launch Dimashq, an academic peer-reviewed journal, republish out-of-print books, translate classics and put unpublished documents and papers into books. Syria Deeply: Damascus’ ancient architecture and historical sites are also under threat, what can be done to preserve these larger pieces of history? Moubayed: When you are as old as Damascus – 11,000 years old – you need daily maintenance of just about everything. Unfortunately, this has not happened since 2011, because government priorities have changed, funds are unavailable and the city has bloated in size, because so many Syrians are coming here for safety and work. Before the war, Damascus’ population was approximately 5 million – today the number is between 9 and 13 million, although there is no official estimate. This has further drained the city’s resources, which spells out disaster for the Syrian capital and reduced basic services like garbage collection, gardening, water, electricity and the maintenance of sidewalks, gardens and streets. Museums, old palaces and homes, churches and mosques, cobbled streets and schools have all been affected by this shortage of funds and shift in state priorities. Some of the ancient homes have been abandoned and others are being rented out to tenants fleeing the violence in the Damascus countryside. The task of preserving these old homes and palaces is huge and it cannot be handled by the private individuals or Syrian academics. It needs governments and UNESCO. Syria Deeply: Is any work being done to preserve the most recent government documents and records that may contain vital information for those living through the current conflict, such as information on detainees, birth and death certificates and medical records? Moubayed: Our scope starts with 1860, the date of civil disturbances spilling into Damascus from Mount Lebanon, and ends with the late 20th century, where the archives are more endangered than more recent periods of Syrian history. Once we handle what is on the verge of extinction, we will turn to more recent archives. Syria Deeply: In the brutality of war, the importance of preserving history often gets overlooked by civilians who are struggling just to feed their families and survive. How would you explain the necessity of preserving historical artifacts in Damascus to those who may not understand? Moubayed: You are absolutely right. When people are dying, when cities are being pounded – or when children go to bed hungry – what we are doing looks cosmetic, niche and very distanced from the agony of day-to-day Syrians. The Damascenes saw what happened to their twin city, Aleppo, and were absolutely horrified. They shivered at the thought of the same nightmare scenario being repeated in their city – which was so close on several occasions of the past five years. A closer look, however, reveals one very important reality: With the present being so painful and the future so bleak, most people are finding remedy in bygone eras of their city’s history. They are romanticizing how things once were in Damascus – their memories give them a sense of belonging and help solidify roots. Families were close, homes were spacious, pollution was less, good citizenship was high and so was good governance. The more we are able to rescue what remains of that not-too-distant history and remind people of it, the better this serves their defense mechanism and ability to survive – emotionally at least – in wartime Damascus. The era we are preserving reminds people of social peace, economic stability, democracy and nationalistic chapters of Syrian history, related to anti-colonialism and nation-building.